We currently have presence in 49 of 50 states some Canadian provinces, and additional POPs are added as needs arise. To determine if service is available in your particular city, please visit our pop finder. 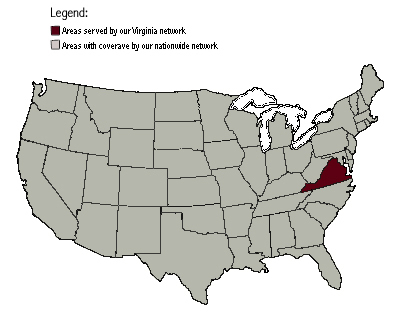 We also offer all dedicated services via our Virginia network. DSL Services are available in many cities nationwide, using networks by Covad and Verizon. For more information on our DSL access services for home and business, see our DSL page. Don't see your area listed? Drop us a note. We are always open to new ideas and suggestions. Perhaps we can expand our coverage so that you can experience our quality service in your area. Please note: we are not liable for any telephone company charges incurred during the usage of your account. If you are in doubt about whether or not the call to our service is local for you, please contact your telephone company. Looking for dial-up numbers? Check out our Member Services.